Obviously, a log home company headquartered in Texas must have a plan named Cattle Creek. That said, the Cattle Creek is perfect for just about anywhere, from your home on the range to your special place in the mountains or on the coast. 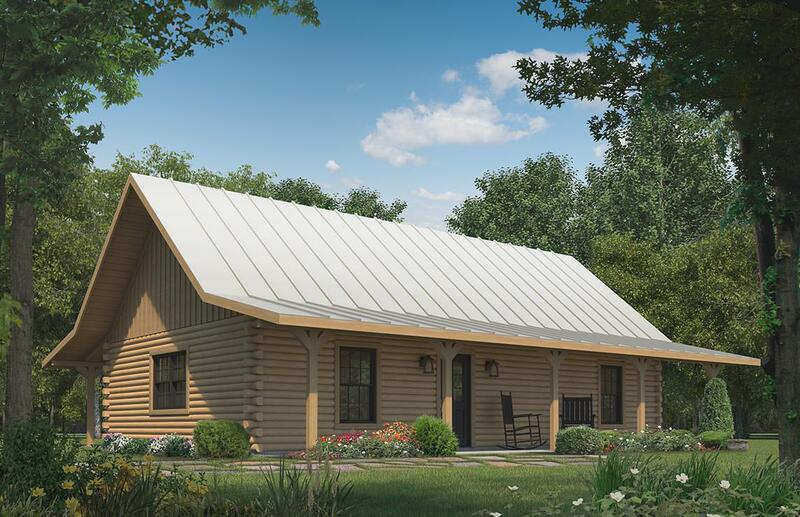 At 960 sq ft on the main floor, the Cattle Creek is a great match for many families. While this is a single bedroom design, it is the first in the Satterwhite plan catalog to include a master bath, plus a half bath... essential for visiting friends and family. Just as essential, an open floor plan connecting not only the kitchen, dining, and living room spaces, but also the people who gather inside. All three primary living areas are unified under a vaulted ceiling, adding a sense of spaciousness that goes beyond simple calculations of square footage. Upstairs, a loft adds 254 sq ft to the living space of this tidy log cabin floor plan. Perfect for hobbies, crafts, or climate controlled storage.